The legendary career of the late Rev. Theodore M. Hesburgh, C.S.C., the University of Notre Dame’s president from 1952 to 1987, will be celebrated Sept. 1 when the U.S. Postal Service unveils a 49-cent Forever stamp in his honor at a ceremony on campus. All are welcome to attend. Beginning at 1 p.m. in Purcell Pavilion at the Joyce Center, the ceremony will feature remarks from Notre Dame alumna and former Secretary of State Condoleezza Rice, Postmaster General and Chief Executive Officer of the U. S. Postal Service Megan Brennan and Notre Dame’s president, Rev. John I. Jenkins, C.S.C. In addition, Rev. Austin I. Collins, C.S.C., religious superior of Holy Cross Priests and Brothers at Notre Dame, will offer a welcome and invocation, and Rev. Thomas J. O’Hara, C.S.C., provincial superior of the U.S. Province of the Congregation of Holy Cross, will say the benediction. A short video on Father Hesburgh also will be featured. Former Notre Dame basketball coach Digger Phelps, who once served on the Postal Service’s Citizens’ Stamp Advisory Committee, will emcee. 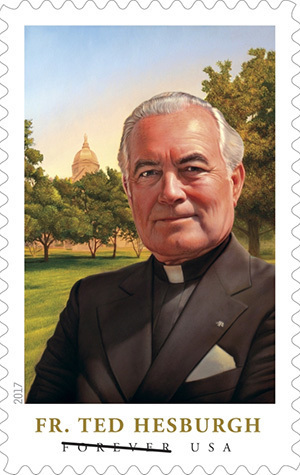 After the unveiling, the stamp featuring Father Hesburgh with a first-day-of-issue postmark will be available at the Notre Dame Post Office and Purcell Pavilion. Stamps also will be available for purchase at the Hammes Notre Dame Bookstore. 16 presidential appointments — from Presidents Dwight Eisenhower to George W. Bush — in which he was involved in most major social issues including civil rights, peaceful uses of atomic energy, campus unrest, Third World development and immigration reform. In addition to the civil rights commission, other notable appointments were to the Presidential Clemency Board, charged with deciding the fate of various groups of Vietnam offenders; the National Science Board; Commission on the Holocaust; and Select Commission on Immigration and Refugee Policy. Service to four popes, three as permanent Vatican City representative to the International Atomic Energy Agency in Vienna from 1956 to 1970. Service as chair of the International Federation of Catholic Universities. Election to the Board of Overseers at Harvard University, including two years as board president, the first priest in either position. Service as co-chair of the Knight Commission on Intercollegiate Athletics. The honor of being the first person from higher education to be awarded the Congressional Gold Medal, presented in 2000, and receipt in 1964 of the Presidential Medal of Freedom, the nation’s highest civilian honor. Reception of 150 honorary degrees, the most ever awarded to one person. Following his ordination, Father Hesburgh continued his study of sacred theology at the Catholic University of America in Washington, D.C., earning his doctorate in 1945. He joined the Notre Dame faculty the same year and served as chaplain to World War II veterans on campus in addition to his teaching duties in the Religion Department. He was appointed the head of that department in 1948, and the following year was appointed executive vice president in the administration of Rev. John J. Cavanaugh, C.S.C. At the age of 35 in June 1952, he was named the 15th president of Notre Dame. Notre Dame has been recognized by the U.S. Postal Service on three previous occasions — in 1988 with a stamp honoring legendary football coach Knute Rockne, in 1998 with a stamp of the famous football backfield known as the Four Horsemen and in 1992 with a postcard celebrating the sesquicentennial of the University. Originally published by Dennis Brown at news.nd.edu on August 08, 2017.